HOUSTON – The space shuttle Endeavour and its six-astronaut crew said farewell to the International Space Station for the final time today (May 29), casting off on the journey home after the shuttle’s last visit to the orbiting outpost. "Houston and station, we have physical separation," shuttle commander Mark Kelly radioed to flight controllers at Mission Control in Houston. Station astronaut Ron Garan of NASA rang a bell as Endeavour drifted away. "Endeavour, Endeavour departing," Garan said. 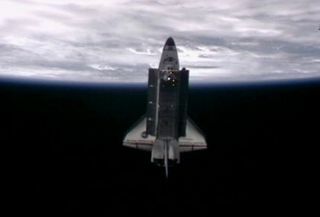 On its final mission, the orbiter delivered a $2 billion astrophysics experiment, called the Alpha Magnetic Spectrometer, and a host of extra supplies to the station. Four spacewalks were performed to upgrade the orbiting laboratory. The fourth and final spacewalk of the mission was also the last one ever conducted by members of a shuttle crew. "It was really great seeing you guys," Garan told Endeavour's crew before the hatches were closed between the station and the shuttle. "We were just in awe of the finely oiled machine that was STS-134. On behalf of Expedition 27, Expedition 28, we want to thank you for leaving the space station ready for its continued utilization, for at least the next decade. You really left us in good shape." Russian cosmonaut and station commander Andrey Borisenko also thanked the shuttle crew and wished them well on the last leg of their flight. "[It was good] to see the shuttle crew visiting here when we were working, and I'm happy that the crew has completed the task and I'm glad that they enjoyed staying and working with us as well," Borisenko said in Russian. "Thank you very much and soft landing." Endeavour's 16-day mission is the 25th and final flight for NASA's youngest shuttle. The agency is bringing its 30-year space shuttle program to a close later this year to focus on exploration missions to an asteroid and Mars. "I just want to say, on behalf of the STS-134 crew, that we had a very successful mission working with Expedition 28," shuttle commander Mark Kelly said. "It's been a great number of days docked. We're looking forward to getting home and we're going to leave these guys to a little peace and quiet." Kelly also paid tribute to the U.S. troops to commemorate this weekend's holiday. "On this Memorial Day weekend, I'd also like to say, as a crew, we're thanking the veterans out there who have lost their lives in wars, especially recently in Afghanistan and Iraq," he said. "It's very important for the American people to honor those folks over the weekend." Since then, Endeavour has played a crucial role in the assembly of the space station, delivering sections of the backbone-like truss system, solar arrays, the node 3 Tranquility module, the Cupola observatory, and most recently, the Alpha Magnetic Spectrometer. After undocking from the station, Endeavour will perform two victory laps around the complex to conduct a special test that will help next-generation spacecraft dock to the International Space Station in the future. The Sensor Test for Orion Relative Navigation Risk Mitigation, or STORRM, will test high-definition imagery and laser-based sensor technology that will be used to assist future spaceships, such as NASA's newly announced Multi-Purpose Crew Vehicle, in their rendezvous and docking operations at the space station and other potential destinations beyond low-Earth orbit. While Endeavour was docked at the station, an issue was detected with the STORRM camera's data recorder, which could affect the engineering team's ability to collect imagery data during the flyaround and "re-rendezvous" operations after undocking. "We were fortunate that we were able to get some great data on rendezvous," STORRM principle investigator Heather Hinkel said in a news briefing today (May 29). "We have procedures prepared if the recorder comes up nominally [tonight]." The flight test should, however, allow the STORRM team to collect a sufficient amount of optical sensing data, Hinkel said. Once the STORRM test is complete, Endeavour will resume its regular separation procedures to take it away from the space station. The shuttle will then spend two days in orbit before its scheduled landing at 2:35 a.m. EDT (0635 GMT) at NASA's Kennedy Space Center in Florida on Wednesday, June 1. Endeavour launched on its final mission on May 16, and docked at the space station two days later. As NASA's shuttle program winds down, the remaining flights aim to ferry as much hardware and supplies to the station as possible to take advantage of the enormous cargo-carrying capability of the orbiters. After the orbiter lands, it will go through a months-long process to prepare it for public display in a museum. Endeavour has been promised to the California Science Center in Los Angeles. NASA has one final space shuttle mission planned after Endeavour lands – the STS-135 flight of Atlantis in July.